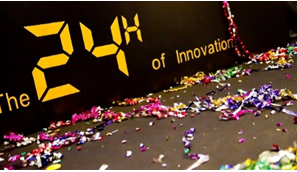 Created by the Institute of Technology ESTIA in 2007, “the 24h of innovation” is an event based on creativity and innovation in 24 hours. The main objective is to experience comething extraordinary to create synergies between the different participants: company, students, teachers, consultants, researchers, institutions. Developing creative and innovative concepts, products and services (software, artistic creation, communication and marketing campaign, new organization…) based upon themes and subjects proposed by companies, laboratories and creators. Since 2007, more than 60 editions have been organized in France and other continents (Asia, America, and Africa). This event has brought together about 25.000 people, 300 companies, 230 schools and universities from more than 40 different countries. Organized within the framework of cross-borders and European projects (“TransferINN” and “Competitiv’eko”), the 1st cross-border edition of the 24h of innovation will focus on Advanced Manufacturing. The insertion / ownership / transfer advanced processes in the industry and in the companies (companies of all sizes, of all sectors, of different traditional or more innovative industrial sectors), such as additive manufacturing, augmented reality, composite materials, robotisation, etc. Students, creatives, innovators, to participate as a team member. Register online to participate on the spot and be immersed in the creative atmosphere of the 24h (group meals taken care by the organizors (limited to 500 persons), art and music activities). For companies, start-up creators, laboratories, entrepreneurs, inventors, associations, NGOs. You can submit your project online for free and it will be made public during the 24h.